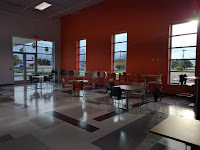 I was just writing a post over at the MissionTexas.net blog regarding the new CEED building in Mission. They have still not completely opened up for business; but, already great things are happening there. Give the blog post a read and visit the links to the items referenced. I hope to be able to share more as their activities start to pick up speed. The gist of it is that Mission is preparing to make some great things happen for the Rio Grande Valley. The CEED building has garnered much attention from other cities in the region and throughout the state. The RGV is on the cusp of something big.